We’re back from the CeBIT conference and there’s so much we’re keen to share with you. It was a big three days with a stellar line up of inspiring speakers and a vast expo, featuring some of the latest innovations in technology today. But more than the next gen cars or the internet of things, what struck us most were the conversations we had with the attending delegates. Like you, many of them were leaders and decision makers in their businesses, and were at conference seeking the right piece of technology to help them achieve their business goals. Over the three days, we definitely saw a pattern emerge in our discussions: A key concern for most delegates was the push towards customer-centricity, and their ability to keep up with the rising demands of the customer. We heard a number of business owners share their experiences on how the increasing availability of new technology to support the buying process had dramatically shifted their customers’ expectations on the level of service they should receive. Significantly underperforming against projected forecasts. We then asked what specifically they would like to be able to do to help them engage with their customers better. 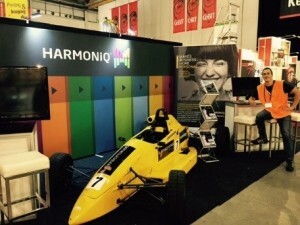 Having heard all of these requirements, we were very excited to share HARMONiQ Business Tuning Software with the delegates at the conference. We showed them how HARMONiQ’s CRM module is designed to help you meet and exceed the expectations of your customers. You’ll be able to delight them with personalised communication targeted to their specific requirements, provide meaningful recommendations based on past purchases, and make sure your sales team never leave a customer hanging again. Set up automated tasks for your sales staff to ensure that no opportunity is missed. Best of all, you’ll have a genuine edge when it comes to offering superior customer service. Following the conference, we’re working with a number of these business owners to start their journey towards excelling in customer service against the new landscape of customer expectations. And we’re eager to help you too! If you are interested in finding out how you can leverage HARMONiQ CRM to better manage your customer relationships, please call me on 0412 421 350 or email me on drew@harmoniq.com.au to see for yourself. Drew Arthur is the Managing Director of Micronet Systems, and is focused on helping business leaders overcome inefficient sales, inventory and customer relationship management practices by leveraging cutting edge technology. If you want to gain better control of the sales processes in your business, click here to see how HARMONiQ Business Tuning Software can make a difference to your business, or click here to get in touch. Change this if necessary.